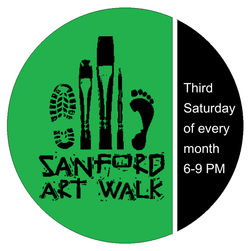 The Historic Sanford Welcome Center invites you to the Sanford Art Walk, a juried art show in the Historic Sanford Welcome Center (230 East First Street, Sanford, FL 32771), and a walking tour of the art venues located in historic downtown Sanford. The event takes place from 6:00 PM to 9:00 PM on the third Saturday of each month. The event at the Welcome Center will include live music and lots of ART! The juried exhibit will hang in the Welcome Center for the month following the event, until setup for the next month’s event begins. During the hanging, the artwork may be sold through the Welcome Center. A 10% commission is charged if the work is sold during the evening of the event, and a 35% commission is charged for sales during the hanging after the event. Visit www.SanfordArtWalk.com For Even More Info! Writing Group Sanford Writers meets at the Historic Welcome Center on Mondays from 5:00 p.m. to 7:00 p.m. The Arts are thriving in Sanford, and the literary community is a part of that culture. This group exists to discuss/learn elements of craft, generate new work, and serve the community of writers in Sanford. All genres. Email SanfordWriters@gmail.com with any questions. This award is chosen by a panel of two or three judges prior to the event, and is awarded a $100 prize. This award is chosen by attendees at the event, via a secret ballot, to be awarded a $50 prize. To enter the event as an artist, please review the rules and application information. For more information regarding this event please contact us at info@sanfordwelcomecenter.com. September 15, 2018- “All Things Considered”- Open theme, have fun! October 20, 2018- “Sanford Pumpkin Fest” –Join us for gourdmania outside in the courtyard and enjoy a fantastic art exhibit from the Artist League of Orange County. Art Walk submissions are open to ALOC members only but the exhibit is open to the public! November 17, 2018- “Home for the Holidays” – November is the official kickoff of the holiday season. This month we will feature artwork that celebrates however you celebrate any or all of the end of year holidays. This artwork will hang though the end of the year and be featured along with Christmas Trees in December. December 15, 2018- The Elf’n Christmas Tree Show –The Sanford Welcome is displaying Christmas Trees in or building which has been infested with elves! Come out and vote for your favorite decorated tree and help us find all of these elves! January 19, 2019- “Black and White Forever”- some combination of black and white, white and black or…well, you get the picture. March 16, 2019- “Art is a Drag”- Back by popular demand, our fourth annual Art is a Drag Art Walk extravaganza that showcases the art of drag! As part of this event, the Sanford Seminole Art Association will be displaying work form their members that features color, color, fabulous color! Art Walk submissions are open to SSAA members only but the exhibit is open to the public! April 20, 2019- “Florida Wax”- This month sees a return of an exhibit of the ever-popular work by Florida Was. Art Walk submissions are open to Florida Wax members only but the exhibit is open to the public! May 18, 2019- “Animals” –From man’s best friend to keepers of the forest and everything in between, animals warm our hearts and stir our emotions. Let’s take this time to appreciate all artists’ take on the animals that share our lives and share our planet. June 15, 2019- “Heat Wave” – In the long, hot, dog days of summer, our call to artists this month is for art that depicts summertime, how you enjoy the summertime or how you “beat the heat”. July 20, 2019- “Aperture”- Back by popular demand, a show just for the photogs and shutterbugs out there! August 17, 2019- “Nouns”-This month’s theme is that most essential part of speech, which encompasses people, places, things or ideas. Pretty broad, have fun! Deadline for submission: August 13.